I Made a Pen Stand! I like woodworking. I mean REALLY like woodworking. Unfortunately, I haven’t had the space or the tools to do it since I move away from home several years ago. Well, a couple finicky vintage pens changed all that. They only like to be stored nib up. If stored on their sides they spit ink. 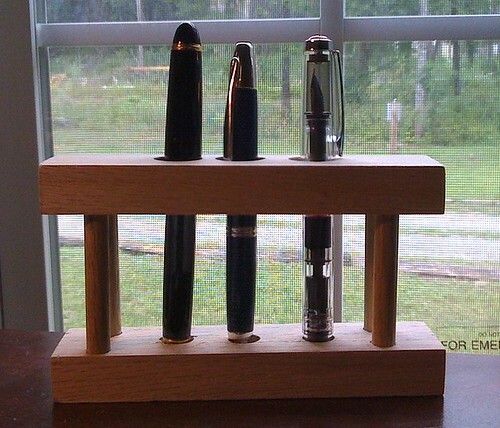 So, I needed to find a way to safely store them nib up: enter the pen stand. This is wonderful and so simple. Thanks. I knocked it together really quickly. It’s a little rough, but it works. Once I get my shop (dear Lord let it be soon) I’ll start making much nicer things. Until then, it was an easy little craft project.